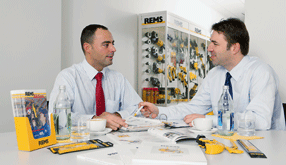 REMS GmbH & Co KG - REMS – Market strength through a consistent product and sales philosophy. REMS’ basis for market strength is technically-advanced and high-quality products as well as a product range tightly concentrated on high turnover units and highly competitive prices thanks to the rational, economical in-house production. At the centre of the sales philosophy the principle has always been that REMS products are sold exclusively via specialist dealers. These are supported by REMS in many ways. REMS specialist advisors equipped with demonstration vehicles carry out product training on location and demonstrate the REMS products at on-site visits, counter demonstrations and at in-house exhibitions. They advise in the selection of the tools and find the most comfortable, reliable and economical solution in each individual situation. The consistent sales philosophy is designed for long-term results, trust and predictability. This is how installation professional become familiar with the product range in practice: The REMS specialist advisors are on the road with demonstration vehicles and demonstrate the machines and tools in real situations, directly on the building site.